So much of this reminds me of what I’m introducing to my students:the True Essay based on Katherine Bomer’s new book The Journey is Everything. It’s all about writing to think. That idea seems to be touching on the same idea of adjacent possibilities. 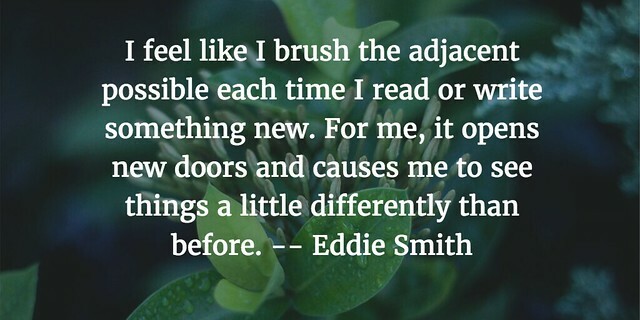 I love that quote from Eddie Smith. Thank you! There are several concepts like this one, the adjacent possible, that I have been exploring over the past few years simply because I had fine folk like you around me bend their ears and eyes my way. Legibility and permeability and feldgang and margin and curation…well. all the usual suspects come to mind over and over as we spiral around and around them in a dance that moves us from practice to theory and back again. That is why you call your post ‘gobbledygook’ right? It never feels perfectly right does it? No, but the approximation of it, that is what is given to folks like us who know deep in our hearts that everything we know is only partly right. Or perhaps we know it is wholly wrong but can’t quite scratch the spot that would 100% satisfy that itch. Thanks for your courage in continuing to play the ‘infinte game’ of learning. O, right, that another one of those concepts, isn’t it. In the cage I could see them and what was truly spooky was that two hundred eyes swiveled toward me. Two hundred uproo eyes. The nearest me hopped over and tugged on my pants leg and looked up. Then another and another until I was totally surrounded by them. All those uproo eyes with some vague longing in them. I turned toward Magnus and he wasn’t there. He was already on the other side of the gate, smiling. They began to crawl up my legs, to pull me down. I cried out to Magnus, “You said it was safe. You’d done it a hundred times.” I felt them drag me. 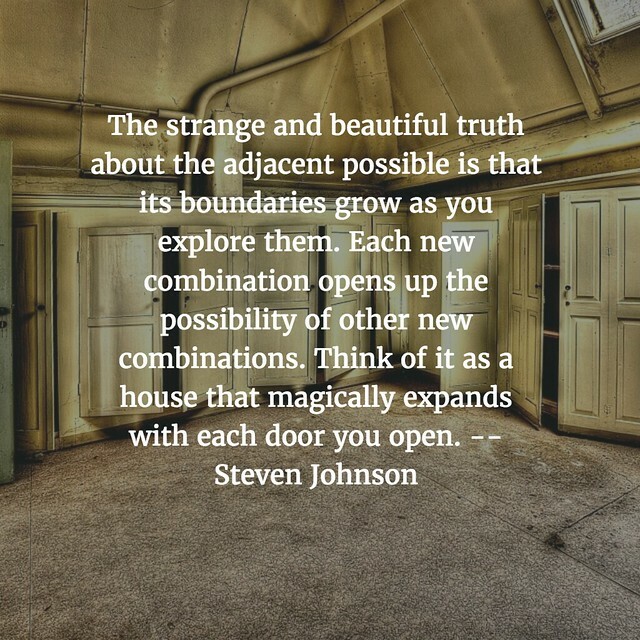 Love this Kevin quote, “We need to discover the wiggle room between one idea and the next, and then dive into that gap with possibilities” It’s all about those possibilities that we have to be willing to explore and allow to be explored by our students. Thanks for this intriguing post. Going back to read it again. Always enjoy ambling through the posts to see what you, Terry and others are writing. Never know what I’ll discover. Since this is Halloween eve, make an acknowledgement that this trip into the unknown is scary for many, would be timely. Thanks! 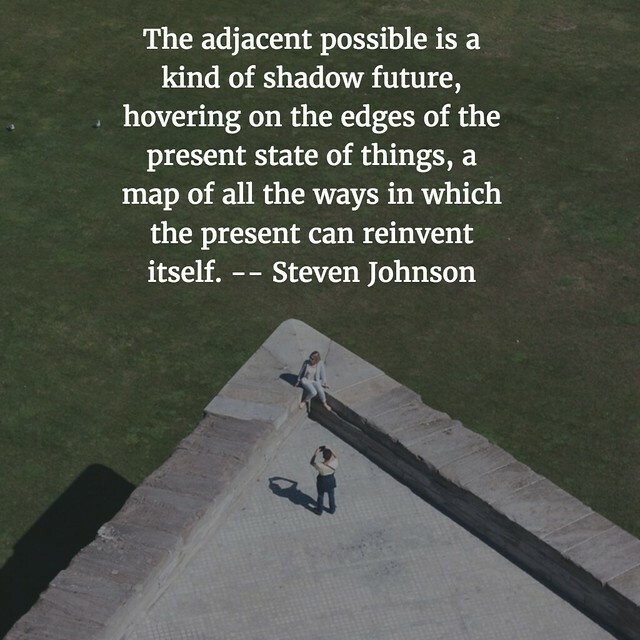 This so beautifully reflects the space of change we’re in today, where the solutions lie in emergent practice. Will share and use this in learning meetings to help some teachers feel more comfortable in the gap and be willing to move from the here to the there!